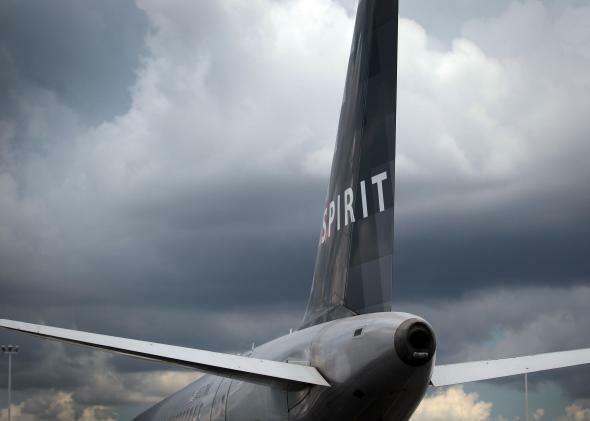 Airline complaints: Report shows Spirit gets the most, and flight problems are the biggest issue. Spirit Airlines dwarfs other domestic carriers in terms of customer complaints. People love to complain, especially when it comes to airlines. Luckily for angsty air travelers everywhere, U.S. PIRG Education Fund, a nonprofit research group, just released a report on everything you need to know about airline complaints in recent years. Here are four key takeaways. 1. Which airlines get the most complaints? 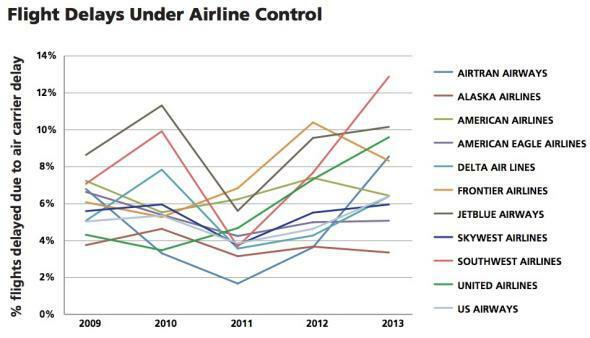 Spirit dwarfed other major domestic airlines in terms of complaints from 2009 to 2013. “They claim to be a budget airline and then hit their passengers with unavoidable fees, or fees that are unexpected and hard to avoid, like having to pay $100 for your carry-on at the gate,” says Laura Murray, a consumer associate at U.S. PIRG. Since 2008, the Department of Transportation has hit Spirit with multiple fines over violations of consumer protection laws. 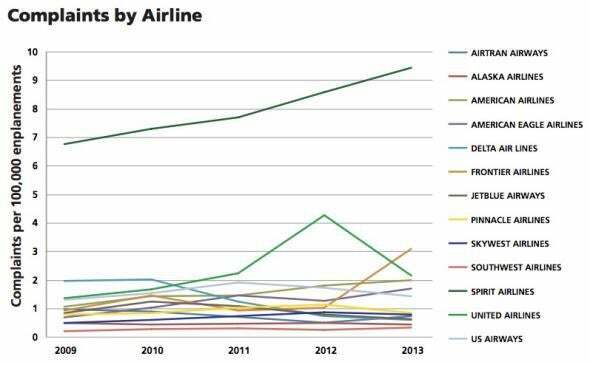 Frontier Airlines had the second-highest rate of complaints in the past year, followed by United and American. Southwest and Alaska airlines made out the best of the bunch, with fewer than 0.5 complaints per 100,000 passengers. 2. What issues do people complain about most? Of more than 9,000 complaints submitted in 2013, 3,473 were about “flight problems,” a broad category that includes delays, cancellations, missed connections, and some other miscellaneous issues. Flight problems also made up one-third of all domestic complaints over the past five years. The next biggest causes of consumer ire in 2013 were customer service and baggage. 3. But how many of these flight problems were really due to bad weather? In some ways, the prevalence of complaints about flight problems in 2013 is probably not surprising considering the early onslaught of Winter Storm Nemo and then the frigid temperatures and record snowfalls that hit the U.S. in late December. Extreme cold can be disastrous for air travel, as Business Insider explained a few months ago. On the other hand, not all delays can be chalked up to weather issues, and the 2013 hurricane season was uncharacteristically mild. Overall, complaints about flight problems actually declined by 7 percent from 2012 to 2013, but many airlines saw increases in flight delays considered within their control, such as those due to maintenance or crew problems. Southwest, JetBlue, and United have some of the highest numbers in this category, reversing positive progress they’d made between 2010 and 2011. Chart from U.S. PIRG Education Fund. 4. Is this an unusually high number of complaints for airlines? No, not really. Total complaints in 2013 dropped 15 percent from the previous year and were roughly on par with complaints in 2011 and 2010. According to a separate annual report on airline quality, the industry as a whole improved in 2013 and earned its best score in the 23 years since researchers started charting that measure.